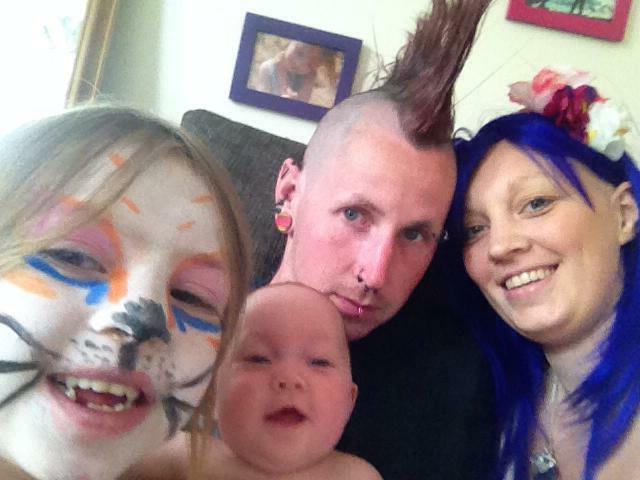 Cervical cancer symptoms missed because she was pregnant. 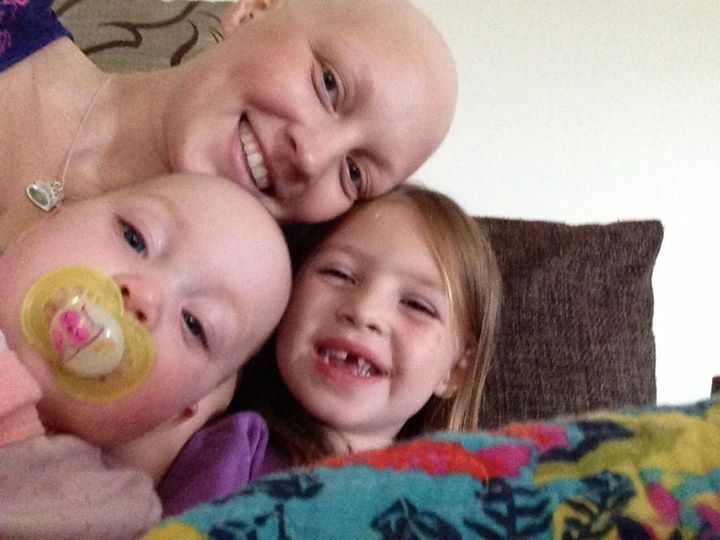 Now this mum is facing her last Christmas with her daughters. Imagine this was your last Christmas with your kids. Imagine this was the last time you would decorate the tree together, the last time you would help them leave out treats for Santa, the last time you would see the joy on their faces on Christmas morning. 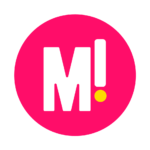 That’s what 29-year-old UK mum-of-two Samantha Beaven, is having to deal with right now. Last year, when the primary school teaching assistant was pregnant with her second child, she felt that something was very wrong. She was suffering severe bleeding and cramping. According to the The Daily Mail, Samantha says she went to hospital at least 10 times, but was told her symptoms were just normal signs of pregnancy. “Eventually I had to take the doctors and midwives at their word and trust that things were okay,” she says. 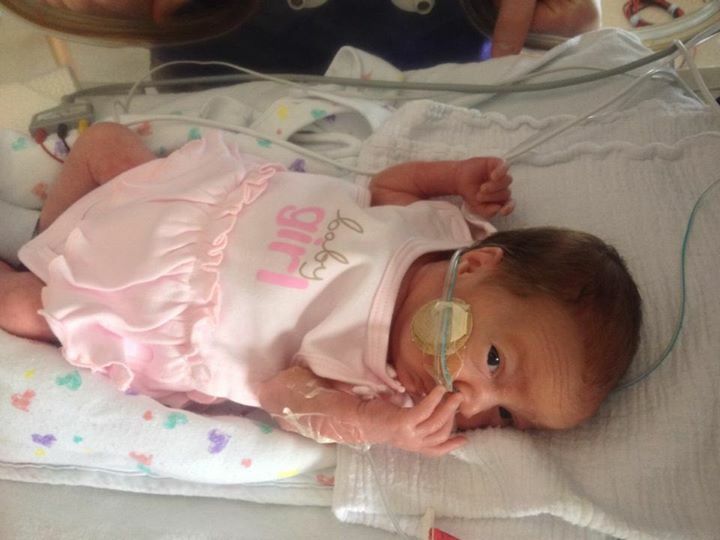 "Daisy needed bowel surgery when she was just weeks old." Image via Facebook. But what Samantha didn&apos;t know was that symptoms of cervical cancer can include unusual bleeding, excessive tiredness and lower back pain. At 26 weeks, Samantha feared she was having contractions. When she went to hospital, a midwife examined her cervix. She saw that it was 2cm dilated, but she also saw a lesion that had been causing the bleeding. A biopsy was done, and two days later, an oncologist arrived at Samantha&apos;s bedside. "When he said I had cervical cancer my hands went straight to my bump," she remembers. "I just kept saying to him, &apos;But I&apos;m about to have a baby.&apos;"
Although Samantha was devastated to hear the diagnosis, her focus was on her unborn daughter. She and her fiance Alex had already named her Daisy, a little sister for their eldest daughter Bracken. The doctors planned to deliver Daisy by caesarean at 30 weeks, and then perform a hysterectomy on Samantha to fight the cancer. But then Samantha&apos;s waters broke and Daisy was born weighing just under 1kg. Samantha and her daughters Bracken, 6, and Daisy, 1.. Image via Facebook. "At first I was too scared to see her, but Daisy was so strong I knew I had to be strong too," she explains. "I couldn&apos;t touch or hold her, but she was so beautiful." Mother and daughter fought for their lives at the same hospital. 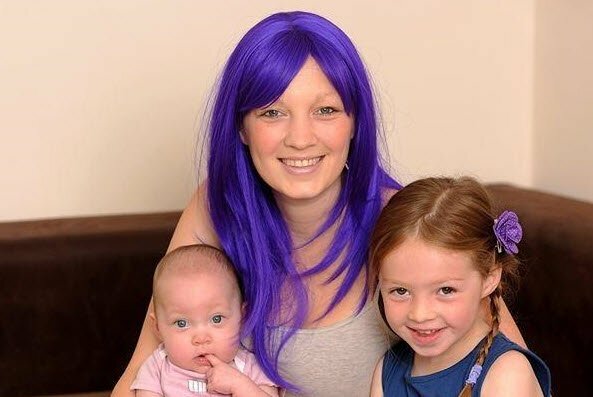 Samantha had chemotherapy and radiotherapy, while Daisy needed bowel surgery when she was just weeks old. A few months later, amazingly, things were looking good for the family. Daisy was ready to go home from hospital and Samantha was told there was no more sign of cancer in her cervix. "It was like we&apos;d both had death sentences lifted," Samantha said. Then, in May this year, Samantha developed a bad cough that wouldn&apos;t go away. She received the worst possible news. The cancer had spread to her lungs. She was given 12 to 18 months to live. Samantha and her family, making the most of every moment. "I cried for two weeks solidly," she remembers. Samantha decided she wanted to marry her partner Alex, and planned the wedding in just two weeks. Bracken and Daisy were bridesmaids. Photos capture the happiness on the face of the beautiful bride. Although she&apos;s had chemotherapy and is looking into alternative treatments, Samantha has also had to accept the tragic reality that her daughters might have to grow up without her. She has been making memory boxes and filming videos for them to watch when they&apos;re older, so they&apos;ll always remember her and know how much she loved them. She&apos;s now focusing her attention on planning the best Christmas ever. She knows it might be the last she has with Bracken, 6, and Daisy, 1. "I want to make this Christmas so special for them. I hope to create some special memories for us all," Samantha said. To help Samantha, go to her fundraising page. The moment a father says goodbye to his baby boy.